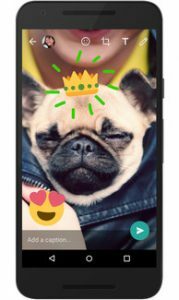 WhatsApp is doing what it can to keep in line with Snapchat and iMessage by introducing photo editing. Like its competitors, you can now overlay your images and videos with text, emoji and drawings. WhatsApp has also added a Snapchat-esque front-facing flash, for taking better selfies when it’s dark. The new features will add an exciting new element to the app, now that you can have fun with your photos, but there are also more practical tools, like being able to zoom before you shoot video. Even so, it’s a great update for WhatsApp’s 1 billion+ monthly users. The good news for Android users is that you can update now, iOS users will have to wait a little longer. Whatever you think about Snapchat, there’s no denying its success – naturally developers will be trying to emulate that. Mark Zuckerberg recognised this when he tried to buy it from its founder, Evan Spiegel – for a whopping $3 billion.